I was originally not going to post this recipe because I whipped it up in a hurry and thought it was too simple. But then I took it to a party with me last night and was surprised to find that it was a huge hit! I guess simple is often better. Originally I was inspired to make this because I have a sage plant growing in my kitchen that was looking a little scraggly, and was desperately in need of a trim. As I’m sure you are aware, pruning your herb garden means cooking with the cast-off trimmings. I think most people think of sage primarily for things like turkey and stuffing, but since we are vegan and gluten-free, I had to come up with another way to use it. I remembered that sage pairs really well with white beans, and since I knew I had a party coming up, I figured I’d make a dip to stand in for the ubiquitous hummus platter. Working with sage is a really enjoyable experience. 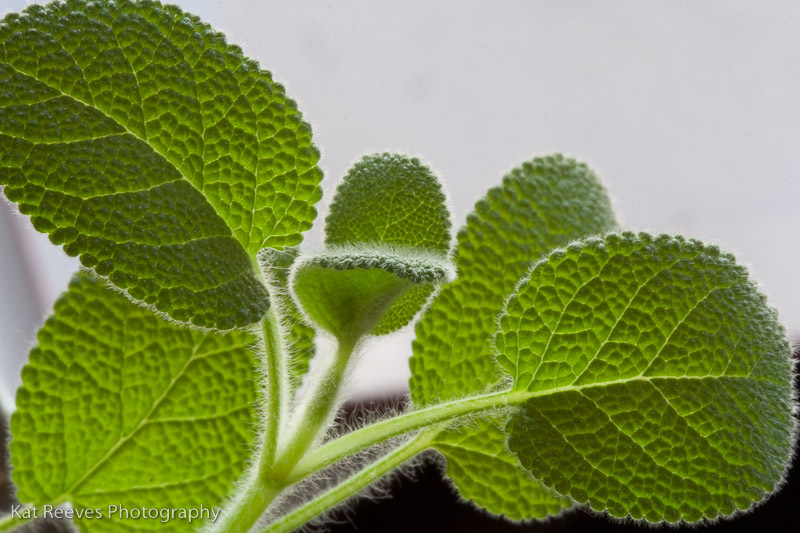 If you’ve never played with fresh sage in your kitchen before, I think you will be pleasantly surprised. Not only does it smell amazing, but the tactile experience is fun too. Sage is furry! And it chops up really fine without getting crushed and soggy like some other herbs can. 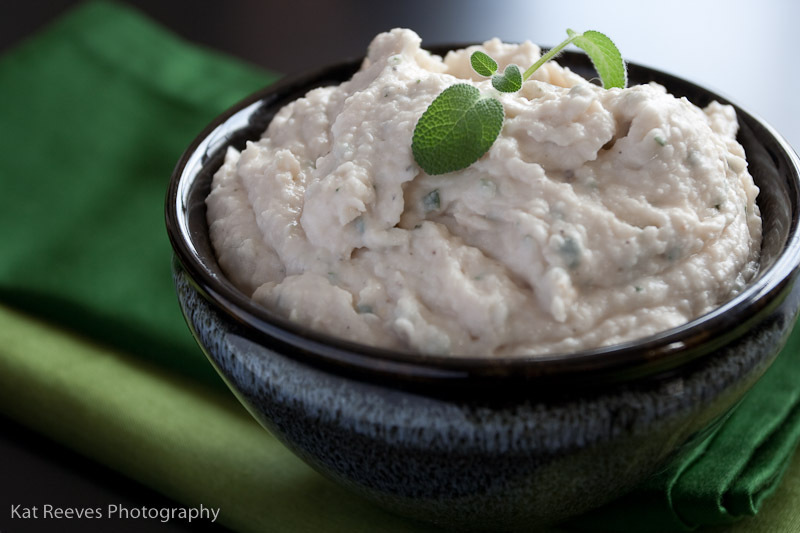 This dip is great with veggie crudites, the same way you’d eat hummus. But also really does well as a spread on crackers or bread. I spread my leftovers on a raw gluten-free “bread,” topped it with lettuce, onions, tomatoes, and a tiny bit of fleur de sel for an open-faced sandwich. Heaven. I used cannellini beans for this, but I think navy or great northern beans would work great too. I also opted to use garlic oil instead of putting raw garlic into the dip because I wanted only the tiniest hint of garlic, and I didn’t want it to overwhelm the sage. If you are a garlic nut, go ahead and toss a few cloves in and see how it goes. NOTE: You can easily make your own garlic oil by slicing the cloves from a bulb of garlic and warming them gently in about a cup of oil. You don’t want them sizzling violently and jumping out of the pot, just heated through enough to infuse flavor into the oil. Place the beans, lemon juice, salt, and pepper into a food processor and process until a thick paste forms. Using the feeder tube and with the food processor still running, add the oil. Continue to process until the texture is very smooth. Add the sage leaves and pulse a few times just to mix them in. Serve as a dip or a spread. Will keep in the fridge for several days. Sounds yummy, and with tomatoes, so colorful! Thanks Deb! It is a tasty lunch for sure. Those tomatoes were so ripe, I had juice running down to my elbows! 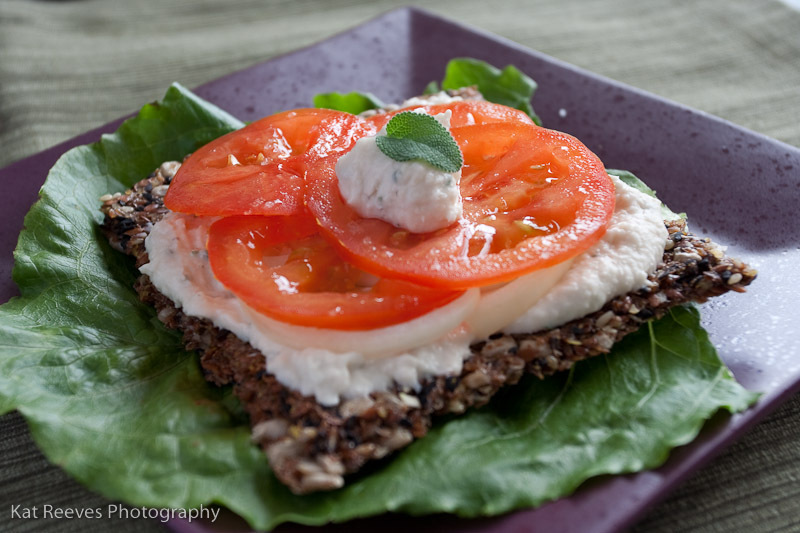 Did you make your own raw bread in a dehydrator? If so, what did you use in it? I was all excited to make a raw onion bread during the snow, since I was stuck inside anyway, but it just did not turn out. It stayed on the soggy side even though I ran it for 10 hours. I did make my own raw bread in a dehydrator, yes. I used the “Black Sesame Sunflower Bread” recipe from the book “Ani’s Raw Kitchen” (which is a great book if you don’t have it). The recipe was really easy and the bread turned out great: not soggy at all and not so snappy that it doesn’t really work as “bread.” I made a double batch and so far it’s keeping really well in the fridge. I would definitely recommend the recipe! 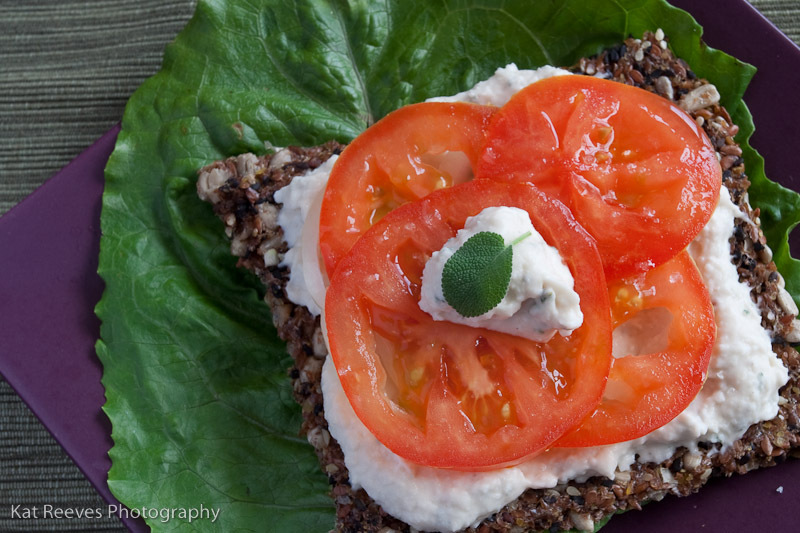 Here is the raw bread recipe btw so you can see what was in it. I used the “optional” garlic and onion, highly recommended! I used a rosemary and garlic infused oil and only 1/4 cup of it. I added about 2 tablespoons of water to make up the difference in liquid. I love the idea of using this dip on a sandwhich!